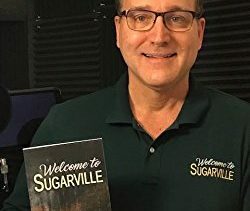 Join us on April 24, as Jeff Haas reads excepts from his newly-published work, Welcome to Sugarville: A Novel in Stories, and discusses the creative writing process. Living a self-described “Jekyll-and-Hyde existence” as both a technical writer and a creative writer, Jeff gives insight into where the two meet, blend, then diverge. If you’ve ever thought about your inner creative writer and have wondered how to set it free, or how to admit you have one, this is the meeting for you! Jeff Haas has published fiction and poetry in a wide variety of magazines such as Shenandoah, Rattle, The Magazine of Fantasy and Science Fiction, Asimov’s Science Fiction, Baen’s Universe, and Writer’s Digest. He is a Senior Content Developer at ADP and a Fellow of the Society for Technical Communication, and he has been an Instructor in the Creative Writing Certificate Program at Emory Continuing Education. Haas is a graduate of the College of the University of Chicago in English Language and Literature and is the current President of the Alumni Club of Atlanta. Jeff is a former president of STC Atlanta.